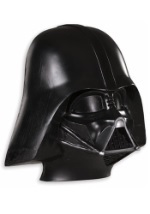 Defend the Galactic Empire as Darth Vader in this black face mask. It is a half injection molded mask with detailed features that make it look real. This is an officially licensed Star Wars accessory.